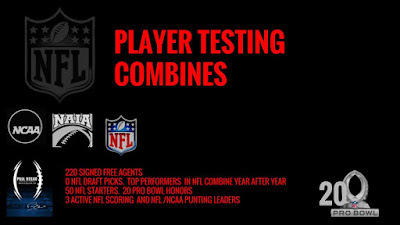 Free Agent - Draft Eligible Senior and College Early ID Events offer players the chance to demonstrate their ability kicking, punting and long snapping for Draft and Free Agent gauge on ability by participating in player testing skill and ability test that reflects the players technique, potential and mental makeup as compared to Pro Standard. All Player Testing Combines start at approx. 10am players should arrive early to get checked in if necessary and plan to leave on last day after 4pm.